Glow sticks are a popular choice for summer holidays such as Fourth of July, as well as stock piling our emergency kits in our houses and schools. While they are pretty, fun, and many parents think of them as harmless, there are first a few things that you should know about before giving them to your kiddos, such as the ingredients inside. 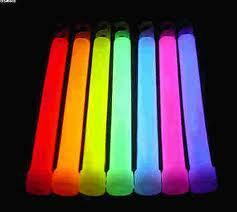 Glow sticks have the following ingredients inside: dibutyl phthalate, Hydrogen peroxide, Phthalic ester, phenyl oxalate ester, and small shards of glass. When you ‘break’ or ‘crack’ a glow stick, you are literally breaking the small pieces of glass inside and causing a chemical reaction. When you start to shake the glow stick to let it ‘glow’ you are mixing around that chemical reaction in order to let the ingredients travel the entire length of the stick. The ingredients themselves have a long list of horrible health hazards and concerns. Among some of the most concerning are infertility, negative effects of unborn child, cancer, and endocrine disruptions. We will go through each one and explain the hazards of the chemical. Dibutyl Phthalate is used, in general, as a fragrance ingredient, plasticizer, and solvent. It is found in over 300 products according to the EWG including nail polish, wart remover kits, inks, dyes, leather, and glue. In the case of glow sticks it is used to make the plastic flexible. It is the chemical that has the highest concern for toxicity not only to you but your unborn child. There are known reports of reproductive toxicity for men and women, as well as clear evidence of endocrine disruption. Also it should be noted that this ingredient is banned in several countries and is on California’s Prop 65. Hydrogen Peroxide is something that is familiar with all of us, and is sold over the counter in a much diluted solution. When it is used in the glow sticks it is much, much more concentrated. This concentration is poisonous for your skin, nails, and lungs. There are moderate concerns (according to EWG) of organ system toxicity and highly corrosive when used in this concentration. Phthalic Ester is a substance that is added to plastics to increase flexibility, durability and transparency. Phthalates are being phased out in many products due to health concerns. It is another ingredient part of California’s Prop 65 and has been known to cause fertility issues as well as cancer. It also has a high concern of being passed to an unborn child. Phenyl Oxalate Ester is responsible for the luminescence in a glow stick. The reaction with hydrogen peroxide causes the liquid inside a glow stick to glow. There is no information on EWG about this specific ingredient however, being that it is responsible for the luminescence in the glow stick, we can assume that it is no safer than the preceding three ingredients. Glow sticks are a fun way to enjoy many activities but there are some safety precautions that are suggested if you are going to let your children play with them. First, inspect them and make sure that there are no leakages or cracks. You should also never let a child put them in their mouth, chew on them, continue to ‘break’ them after they are already glowing and keep a careful watch on them. If you get these substances on your skin immediately wash off with cool water and (personally) would contact your doctor or even poison control to be safe. Our skin is the largest organ we have and things that get on our skin, wind up in our body at an alarmingly fast rate. It is recommended that only older kids use this product and be told of the potential dangers if they are used incorrectly. Even though this is sold as a ‘non-toxic’ product for young (3+) children, it is clearly not ‘non-toxic’ and clearly not for young children – at least not unsupervised. Keep your children safe this summer and be aware of the potential hazards that are out there. While some parents may think that it is silly to try and ‘ban’ everything that has a potential hazard for their kids, especially when it impedes on them having fun, it is great to be at least aware of the dangers so that you can act appropriately if an emergency occurs.